Consumers who shop online looking for a bargain can often end up losing money rather than saving it. Online shoppers have discovered that money is being drawn from their accounts for months on end after signing up with discount shopping schemes. The internet is a great place to purchase goods, often for a lot less money than in the high street stores. Online shopping is also a convenient way to purchase train and airline tickets, fast food home deliveries and shop at major online stores. But many customers have found that shopping with well known stores has led to them actually losing money. Consumers have signed up to shopping discount sites they assumed were free only to find monthly payments being withdrawn from their bank accounts. When online shoppers purchase goods from well known online stores and pay by credit card they can often be directed to discount stores. Discounts websites are causing confusion as many shoppers think they are still dealing with the original stores not a separate shopping entity. After the original purchase has been made the shopper is then invited to sign up to the discount website. Many online shoppers assume this service is free only to discover that monthly payments are being debited from the accounts. It is only when customers check their bank or credit accounts that they realise they are being charged to receive shopping discounts. Confusion has arisen over the free memberships offered by the shopping discount websites. 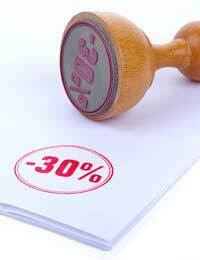 Online shoppers are offered a 30 day free trial with the shopping discount websites. But if shoppers do not cancel this membership after the 30 day free trial they will automatically be debited a monthly membership fee. This membership fee can be as much as £10 per month; a small enough monthly fee to go unnoticed on a credit card or bank debit statement. Shoppers should always read the small print when signing up to any offers online. Taken at face value the discount shopping sites look like a bargain. Simply sign up and receive up to 30% off purchases made from over 900 retailers. But as the saying goes, if it looks too good to be true it usually is. Many customers who sign up have had hundreds of pounds withdrawn from their credit card accounts. This has gone unnoticed due to the fact that many people rarely check their monthly statements item by item. It can take months or even years before this financial discrepancy is found. Online discount shopping websites cannot legitimately be called scams as they do inform customers of the terms and conditions. Customers sign up and accept these terms and a legally binding contract has been made. But online retailers are taking their customer’s complaints over these discounts websites seriously. Several well known online retailers have severed their ties with the shopping discount websites. The good news is that some of the shopping voucher websites have given refunds to those customers who have complained about the fees taken from accounts. Online shoppers should always read the terms and conditions of any website they sign up to online. Even if the website is affiliated with a well known retailer it should not be assumed that they are the same company. It can be the case that shoppers might not obtain refunds from certain shopping discount websites. Once a contract has been signed it can be extremely difficult to end under the terms and conditions included in the contract. I was caught in a scam by Shopper Discounts and Rewards. Clicked on a money off voucher at end of transaction with M&M Direct. 4 months later (my fault!) found that SDR had deducted £40 i.e. 4 lots of £10 from my credit card account. SDR have now closed my 'membership' and promised to refund £30. M&M Direct abused my trust by allowing SDR to have my credit card details. They are unconcerned and told me that I should have read the smallprint. The fact that M&M Direct receive a kick-back from each membership to SDR of course has nothing to do with their reluctance to take action against SDR. Don't buy from M&M Direct they are as bad, if not worse, than SDR. They allow this scam to operate.